I tried thinking of several possible titles for this article: “The hotel with the Roman remains”, “A night below the foundations of Western Slovakia’s mightiest castle”, something along these lines. Either of the above headings would be true, as would any title to the tune of “Trenčin’s Most Glamorous Hotel.” But again, not quite right. Hotel Elizabeth is one of a select number of that coveted group of hotels known as the Historické Hotely Slovenska (Historic Hotels Slovakia) who set the bar very high with accommodation standards country-wide – character-rich old buildings, a dose of the glamour of yore, resplendent bars and spas, etc – but of this group, it’s one of the more down-to-earth. It certainly doesn’t boast about its best attributes, or put on intimidating airs and graces. Which is why a title which drew attention to any one (or more) of these attributes just wouldn’t do. That said, and with attention span for reading on the web being limited, I’ll harp on about Hotel Elizabeth’s attributes anyway (in no particular order), because they are rather singular. 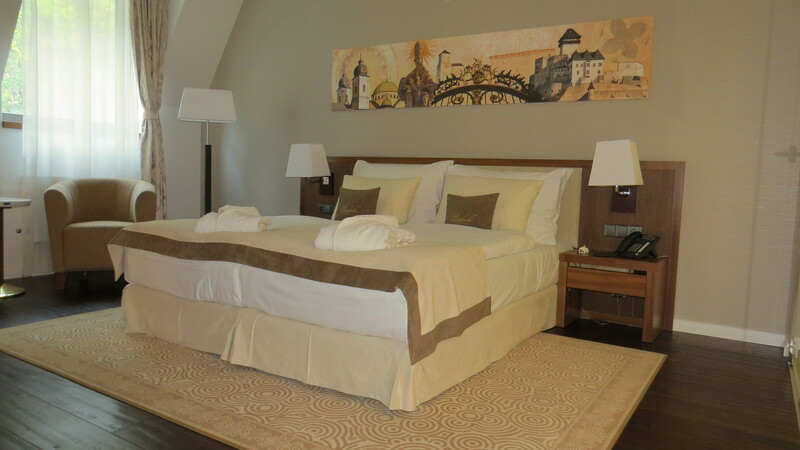 Historické Hotely Slovenska is only 15 hotels strong, and with the exceptions of Hotel Marrols in Bratislava and perhaps Hotel Bankov in Košice, there are no other independent hotels in Slovakia that currently warrant inclusion. No others that tick those necessary boxes, historic character, quality refurbishment and top-notch service. And of the 15, Hotel Elizabeth is one of a handful tourists would ever normally visit, being smack bang in the middle of one of the towns well and truly on the tourist trail. 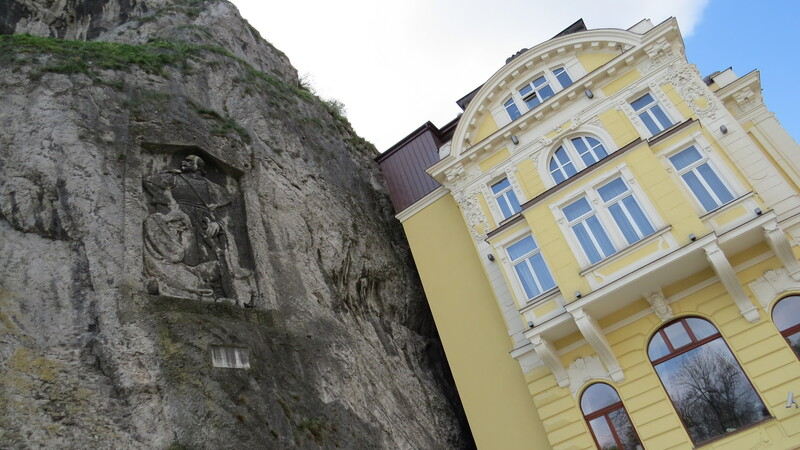 Trenčin makes the cut for Slovakia-bound holidaymakers because of its preserved medieval centre, its straight-off-the-postcard fabulous castle straddling a crag above, and its evidence of early Roman occupation in the region, plastered on the side of the same crag. If you dig any or all of the above, Hotel Elizabeth is very much the hotel for you. 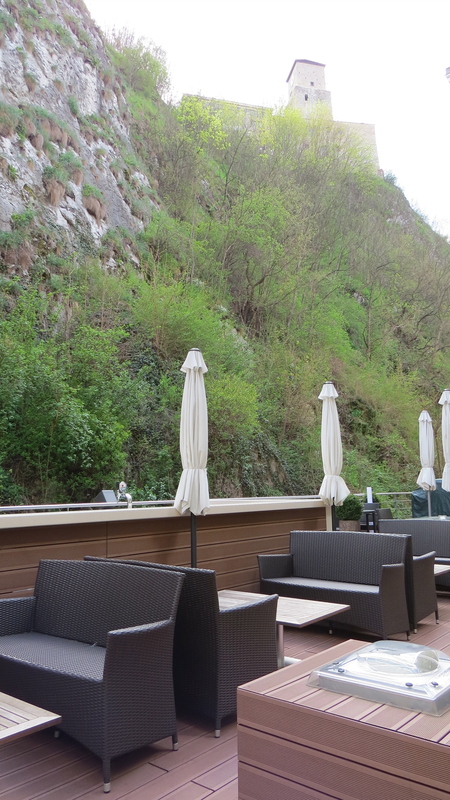 Perhaps it’s the only hotel for you, because it stands like a striking sentinel at the entrance to that afore-mentioned medieval centre, and hugs two sides of the crag, directly below the castle and with exclusive access to those Roman remains. The crenellated lemon yellow and white hotel exterior achieves some nigh-on improbable angles as it skirts tightly around the crag on which Trenčin Castle sits – so tightly the cliff overhangs parts of the building and you feel prompted to park on the other side of the car park to avoid the possibility you can’t help but vaguely entertain, i.e. that there will be a landslide that’ll write off your vehicle. Car parks. I’m not just slipping in a mention of car parks as a creative attempt at listing hotel facilities: I want you to visit the car park if you stay here regardless of whether you arrive by car, because of the intriguing carving high up on the rock face above (a haughty noble with a woman prostrate at his feet). The first of many neat historical points of interest the hotel factors in. As you make your way from car park to reception, I’m not going to deny there are a few wobbly moments. Wobble one: an outlet of the national casino chain Herňa on the premises (in poor taste, I thought). Wobble two: hideous fake flowers by the door (again I sighed but it would be far from the first high-end hotel to make this easily-avoidable mistake). Through the doors though, and you’re in a striking glass-roofed courtyard, which now beautifully joins together what had been two separate buildings: light, lovely and intelligently worked. It’s here where you understand what the hotel is trying to do: play on the history of the building and modernise it. 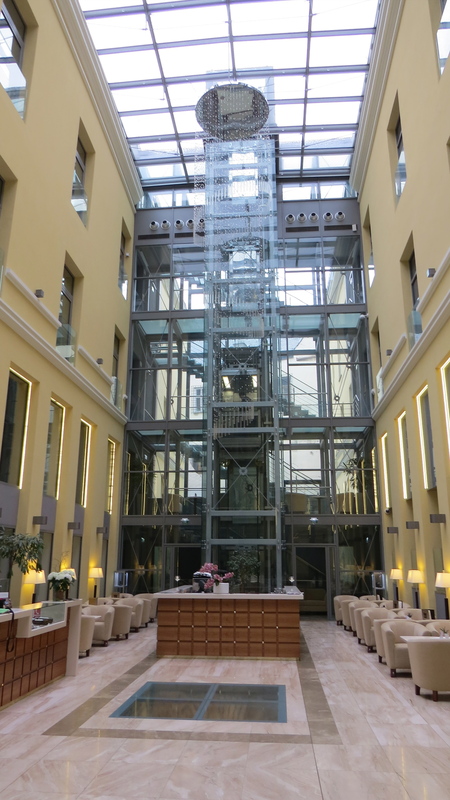 The glass lifts shooting up to the skylights high above; the huge glass ceiling hanging cascading down to the chic lobby bar. Contrasted with the traditional, those lemon yellow old walls again and, right by the reception desk, historical point of interest number two: the ruins of a old bakery (unearthed during the construction of the hotel spa) beneath a window in the floor. We got a castle view room. A castle view unlike any other, because you’re looking up at the castle directly up a wooded cliff which has become a nature haven as development of any kind is impossible. So a myriad birds and an eyefull of looming bastions, but nice because of the extra tranquility, even if the natural light on this side is a little lacking. The space of the doubles is neither bigger nor smaller than you’d expect; the decor is intriguing, however, because gone are the historic features you might have expected, replaced by an absolutely modern vibe I wasn’t anticipating at all. Safe, upmarket, beige-white. The sharp abstract impressions of the old town above the beds weren’t to my personal liking, but they were cleverly done (some would ridicule my old-fashionedness for not liking them I’m sure). Putting the flat-screen TVs in the middle of otherwise gorgeous ornate mirrors was an interesting move. And the art in the corridors doesn’t always work (glamourously dressed ladies clad to blend in with their respective historic-looking backgrounds – and not always blending in). But comfortable beds, oodles of desk space, original toiletries in the spacious bathrooms. No tea- and coffee-making facilities (except in the suites), but they’re always order-able for free – and the lobby bar makes for a good place to sit while you sip. All-told: 78 rooms – and maybe, overall, this is what modern-traditional means for a hotel. In any case, by virtue of the size and the relative glamour, this is hotel of choice for visiting celebs – Slovak premier Fico is a repeat visitor and most leading music acts in the world have bedded down here at some point due to the nearby Pohoda Festival (one of Central Europe’s best and biggest music festivals, in case you weren’t aware). I’m a big fan of the old building subverted by adding a touch of the modern, glassy look: for me that is a definite success story of the post-refurbishment Hotel Elizabeth. From several points on the upper corridors there’s great views looking back down at the interior reception courtyard. But the best example of this is the view from the Marcus Aurelius terrace, an outside bar again sporting a modern, dark wicker vibe. Down from here, you glimpse one of the hotel highlights: those already-mentioned Roman remains, and historical point of interest number three. Essentially, this Roman Inscription , a record of the victory of a Roman detachment of soldiers over Qadi and Marcomanni tribes in 180 AD, is a proof (one of the only surviving proofs) of ancient Roman occupation of the Váh river valley area. There’s a second viewing point, from a small room with translations of the inscription in many languages, around from the terrace. The ancient Rome theme marches on (a little) in the Caracalla spa, a small but prettily colonnaded place with a surprising variety of massage treatments. In keeping with a place that encompasses multiple epochs, the opulent Cafe Sissi on the other side of the lobby is much truer to the hotel’s late-19th century roots. In an elaborate curve (following the cliff, remember) it sweeps around the edge of Trenčin’s old town; high wide windows, exquisite breakfasts, good coffee and cakes, chandeliers, decorated glass panels, sofas standing in as seats. The Restaurant Elizabeth might take over for evening dining, but it’s the cafe that anyone would have to admit was an essential stop-off on a Trenčin best-of tour. I think back now, as I’m writing this, to the first time I came to Trenčin, in 2012. It was raining, which already had me in a bad mood. When I got to the historic centre having (incredibly) initially walked the wrong way out of the train station into a gloomy industrial area, the hotel (it is the first thing you see as your eyes, in that first sweep over the town, wander down from the castle over the burnished steeply-pitched rooftops) was under reconstruction. Corrugated iron, scaffolding, boards on the windows and the sound of the drizzle hammering into them. The location of the building at the beginnings of Mierové námestie, the thoroughfare through the beguiling medieval heart of Trenčin, means it can’t help but be your first impression of the place. It wasn’t a great impression, back in 2012, and Hotel Elizabeth’s state of disrepair had a lot to do with that. That was then. And we reach the point. Since the dramatic makeover and its reopening (2013) the hotel continues to strongly influence Trenčin’s feel. The message it sends out now? That the town is back to being the proud, lively, history-rich place it used to be – with one truly quality place to stay. PRICES: Single rooms 99 Euros, Double rooms 115 Euros, Suites from 165 Euros (2016 prices). 150 Euro weekend break for two deals (see the website) include the very good buffet breakfast, unlimited wellness/spa entry, and one evening meal for two.